More interesting ones to come in Part 8!…. the elongated nuclei of the tumor cells in fibrosarcoma are positioned at sharp angles to each other in linear arrays. This pattern is resembles that of bone of herring fish and hence referred to as “herring bone” Pattern and is a characteristic feature of Fibrosarcoma. Ink dot nucleus of superficial cells ( source ) Ink dot nucleus of the superficial cells, in the Pap smear.The superficial cells are large, polyhedral cells with abundant cytoplasm. The nucleus is very small less than 6 microns in diameter. This karyopyknotic nuclei resembles “ink dot” and is the characteristic of superficial cells which distinguishes from the intermediate cells. Claw Clutching Ball (source ) appearance in lichen nitidus Claw Clutching Ball AppearanceThe histological appearance of lichen nitidus. Here the hyperplastic epidermis with rete ridges is referred to as ‘claw’ and the aggregates of inflammatory infiltrate in the dermis is referred to as ‘ball’, giving rise to characteristic claw clutching ball appearance.. Leaf like pattern in Phylloides tumor ( source ) Leaf like pattern in Phylloides tumor of breast. 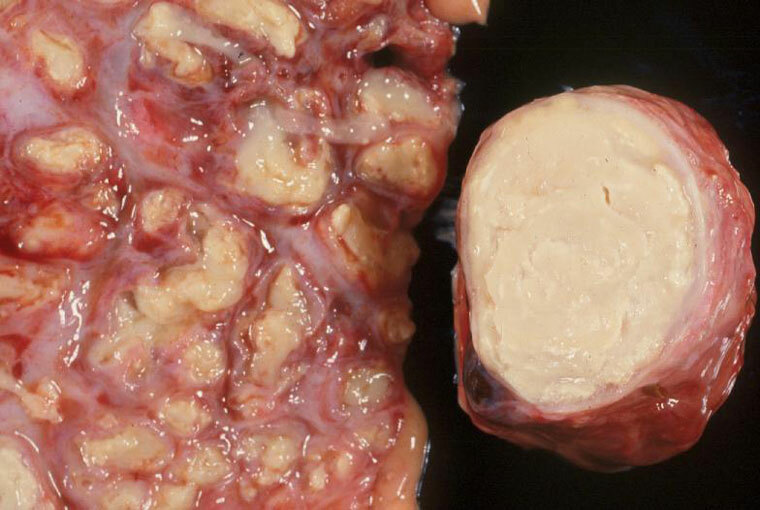 Phyllodes tumor, derives its name from the Greek word ‘phullon‘ or leaf. Cheesy appearance of caseous necrosis(source) Caseous necrosis : is a type of necrosis where the necrotic tissue grossly resembles a ‘cheese’ or cheesy tan to white appearance.It is seen in tuberculosis. 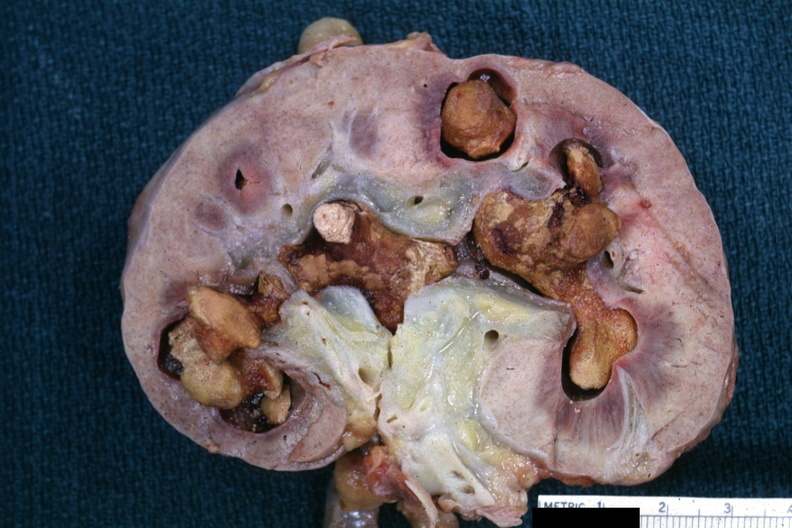 Caseous necrosis is just a combination of coagulative and liquefactive necrosis. It contains a mixture of protein and fat. The fat is derived from the bacterial wall. Smooth muscle nuclei are long and have rounded ends which resembles that of a ‘cigar’. This is an important feature to distinguish smooth muscle tumors like leiomyoma and leiomyosarcomas from other spindle cell neoplasms. Stag horn renal calculi (source ) These are are branched stones that occupy a large portion of the collecting system. These are composed of mixtures of magnesium ammonium phosphate (struvite) and/or calcium carbonate apatite. Tree bark appearance of aorta in syphilitic aortitis. ( View source ) Tree bark appearance of aorta in syphilitic aortitis. 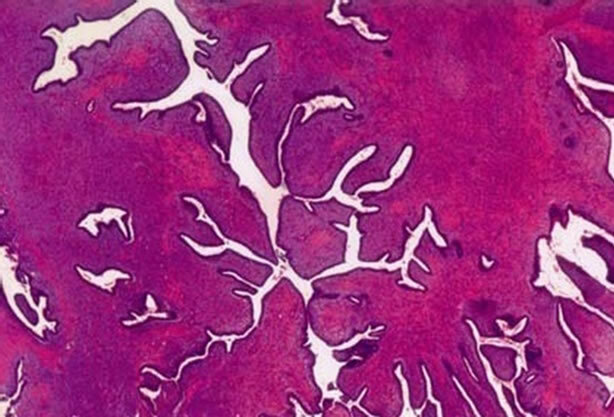 The aorta shows multiple gelatinous plaques which are separated by stellate scars and furrows resembling that of a “tree bark”. A ribbon of thin sections of paraffin embedded tissue, prepared by microtomy.